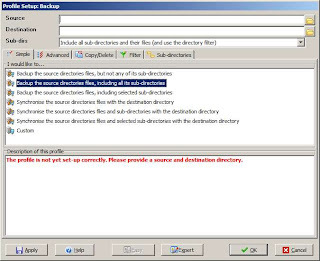 For average computer users in these days, I'd assume that they store all kinds of data on their PCs: documents, photos, video clips, music files, you name it. As hard drive space is becoming cheaper and cheaper, people store more and more of their data on their PCs. (I know people are beginning to organize their documents online, but I'm pretty sure that storing data on local hard drive will still be the main trend for many years) The data become so important that you just can't afford to lose them. But do you know that your C: drive can fail at anytime and all your data will be gone? 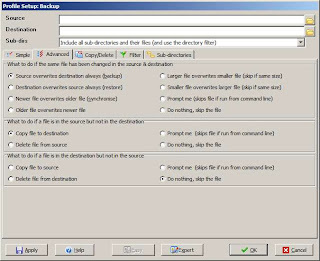 On this screen, under "What to do if a file is in the destination but not in the source", change it from "Do nothing, skip the file" to "Delete file from destination". If you don't do that, your backup drive will be full of garbage as you move files around in your primary drive. (Since the original files are not deleted in your backup drive). Alright, you're ready to backup your files! Just select the profile you want to run and click the "Run" icon in the main window and you're good to go.